Bee pollen is one of nature’s hidden super foods. While honey is popular and sold in every grocery store, bee pollen can be hard to find. Even worse, a lot of the bee pollen that is sold in most supermarkets is low quality and imperfect. A lot of bee pollen supplements include cheap filler ingredients that trick you into thinking you are getting a good deal. In fact, you often will pay more per ounce of pollen than you would if you bought high quality, pure bee pollen. I have collected a few of the best bee pollen brands, and show you where you can buy them at the cheapest prices. Personally, when making bee pollen smoothies I use Stakich bee pollen powder. I like bee pollen in powder form because it is the easiest to add to smoothies. You can also mix it with yogurt or cereal. A lot of other people consume their bee pollen in capsule form or granule form. All of these are fine, but the powder is my favorite. It is also really easy to measure out the exact quantity that I want when eating bee pollen in powder form. I’ve compared prices of pure bee pollen of a lot of places. I’ve looked at my local health food stores, at a lot of online shops and even buying directly from the manufacturer. I’ve found that the best prices for the best quality pollen is actually on Amazon. I was a little skeptical at first and thought I could find a better deal at Whole Foods or somewhere near my house, but now that Amazon owns Whole Foods they both actually have the same price. And the beauty of buying bee pollen on Amazon is that it is delivered right to my house, and I can order a few other things at the same time. And Amazon has a great return policy, so I know I am safe buying whatever I want from them. The one important thing to know when buying bee pollen online is that there are a lot of low quality bee pollens you have to search through to get to the really high quality bee pollen. I don’t want or trust bee pollen that comes from China and is not regulated. I’ve heard one too many horror stories of cheap supplements not being what they claimed or regulators finding lead in certain food products. Because of this I have made a list of the best quality bee pollens available. These are all pure bee pollen that are super healthy and made by well known and trusted companies. If you are looking to get the amazing health benefits of bee pollen, then you need to buy a high quality product, not something that is unpure and might make you sick. Good bee pollen products are those that contain high quality bee pollen and nothing else. The best products are going to be from companies that have been producing bee products such as honey and pollen for decades. These kinds of companies have the experience needed to make a quality product while also raising bees in a sustainable manner. 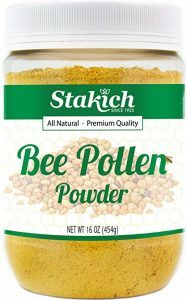 As mentioned before, my favorite bee pollen is Stakich’s bee pollen powder. This is a great quality bee pollen. Stakich is a trusted company that has been family-owned and operated since 1925. Their bee pollen is 100% pure, all natural and unprocessed. It is never heated or dried. This is great quality bee pollen at a fantastic price. The one thing some people might not like about this brand is that it is not organic. You can buy it here. If you want organic bee pollen Greenbow is the company you want to buy from. Greenbow has been raising bees for over 40 years. 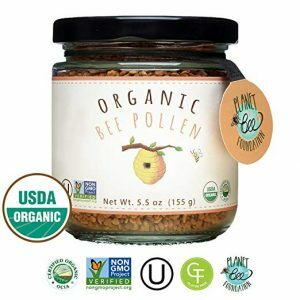 The amazing thing about their bee pollen is that it is certified USDA Organic and non-GMO. This is actually really hard to do for honey, pollen and other bee products because bees travel up to four square miles when foraging for food. To guarantee that the bee pollen is non-GMO there cannot be any GMO products within four miles of the bee hives. Greenbow organic bee pollen is a great product and well worth the price, but it is about twice as expensive, per ounce as the Stakich brand. If you want to ensure that you are getting organic, non-GMO bee pollen, then this should be well worth it. You can buy Greenbow organic bee pollen here. Some people use bee pollen as medicine. Bee pollen is a well rounded food with a ton of potential health benefits. The German Federal Board of Health has officially recognized bee pollen as a medicine. Bee pollen is a complete protein and great at giving people an energy boost. For some people it even helps relieve hay fever. Because of it’s potential medicinal value, bee pollen can also be consumed in a capsule, similar to other types of nutritional supplements and natural medicines. It can be a little tricky finding bee pollen capsules that contain no other ingredients. A lot of pollen supplements contain fillers, like sugar, that you might not want in your body. It is also impossible to balance these other ingredients with the bee pollen because they are all mixed together in a single capsule. Finally, when mixed with other ingredients, you can never be sure how much actual bee pollen you are getting, and how much of the capsule is made up of cheaper ingredients. Because of this, I recommend only taking pure bee pollen capsules. If you want other supplements as well, take those separately. Y.S. 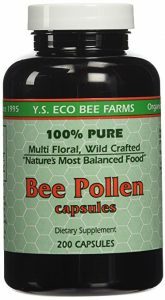 ECO Bee Farms sells high quality pure bee pollen capsules. They are 1,000mg and contain nothing other than pollen; they don’t have any sugars or salts. Buy it here. Next story Which Noodles/Pasta Has The Most Calories? Which Has The Least Calories?